The Stanford Prison Experiment tells the true story of a study from 1971 that divided 24 students into two groups: 12 were chosen to be prisoners, the remaining 12 became guards. The experiment was planned to last 2 weeks but had to be discontinued after 6 days. The results were terrifying. 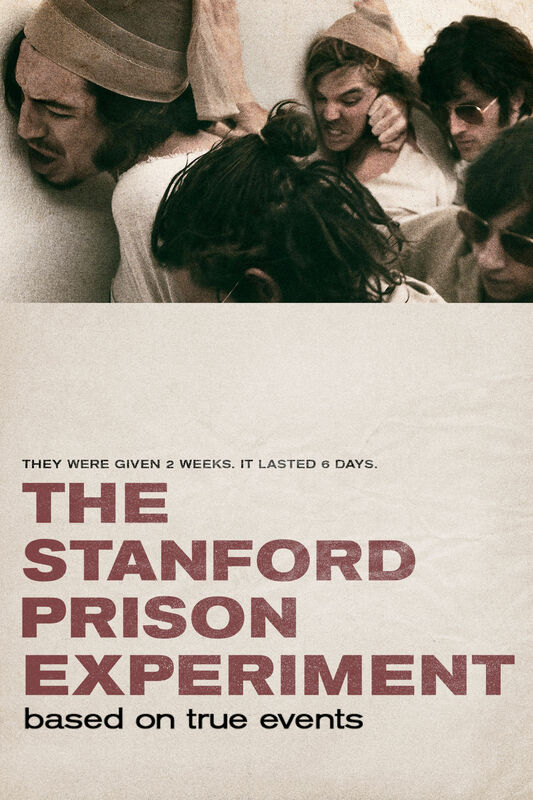 This is the third movie about the infamous Stanford Prison Experiment which revealed how quickly people can adapt if they are assigned with a certain role. The two previous movies Das Experiment (Germany, 2001) and The Experiment (2010) rather dealt with the idea of what would have happened if the experiment actually lasted 14 days while The Stanford Prison Experiment tells the true events and includes the story of the scientist in charge Dr. Philip Zimbardo. The 2010 US version can be quickly dismissed since it was a cheap knock off from the brilliant German movie starring Moritz Bleibtreu, and simply tried to add a bigger shock value. But despite the great cast it bombed horribly in my opinion. I remember I went to see Das Experiment at the movie theater and it was the first time ever I witnessed an entire audience not being able to get up from their seats even when the end credits rolled in. It was very disturbing knowing that human beings are able to become monsters, and the fact that this movie was based on true events left an even bigger impact. 14 years later we get to know the true story and emotions that involved this experiment. Dr. Zimbardo is a very committed and brilliant psychologist who wants to have this breakthrough experiment, and while he sees that the situation is slowly going out of control he wants to continue. He finally decides to stop the experiment after he witnesses an act of unspeakable humiliation. This study is as disturbing as it is important, and confirms that we all have another side slumbering inside of us. The fascinating thing about this study is how quickly people adapted to their roles, even identified themselves with their prisoner numbers and not by their individual names, while the guards insisted on being addressed by their given titles. Once they felt comfortable with the power they were given they started to abuse it and neglected any form of human right, they were not allowed to touch or physically abuse the prisoners but the verbal and psychological abuse was just as bad, if not even worse. And had the experiment continued I am sure they would have gotten physical in the worst possible ways. Scientists like Sigmund Freud have already talked about the abnormal behaviors of human beings and the conscience that keeps telling us to be the way society expects us to be. But once you are in a situation where only two kind of people seem to exist the morals disappear quickly. While the experiment is fascinating from a scientific point of view, I am a little scared for our human race. There are no psychological tests that can proof 100% that someone applying for a job as prison guard isn’t going to overstep their power and starts to humiliate and abuse inmates. Or imagine your neighbor would be given the power over you in some kind of way? Power is a dangerous weapon and as we can see in the current world events it needs to be in the right hands. There are only two kinds of people in the world; followers and leaders. And if they mix the wrong way, people start killing people for no reason. On a lighter note, the world is not entirely bad. I mean I am a nice person who wants to see people succeed and being happy. And I am sure so are you. And I am convinced you can name at least 5 people who are just like you. So there you go. Let’s kill with kindness, and not with hatred and weapons. The Stanford Prison Experiment is a deeply disturbing movie of high value and excellent acting performances. For some, however, it might be enough just to read the facts instead of watching it for two hours. It stuck with me for a while just like the 2001 version.